Though the drama surrounding Phil Lord and Chris Miller’s exit from Disney’s Han Solo film has left plenty of fans nervous over the spinoff’s creative direction, all of them agree that, no matter who’s directing, the finished project will be considered a success so long as it finally gives them a young Chewbacca. “We want to see Chewbacca when he was young and hot,” these rabid hordes have cried out repeatedly across social media and the Tumblr-sphere, drowning out all other Star Wars discussion. “Give us hot, young Chewbacca.” And to them, newly appointed director Ron Howard has finally given up the goods. Look upon Young Chewbacca in this new behind-the-scenes shot tweeted out by Howard. Played by Joonas Suotamo, this Chewbacca doesn’t have the wizened features or weary comportment of your father’s Chewbacca. See how he still bears the auric glow of youth, his puppyish fur soft and shimmering. His face is doe-eyed and gently open to all of life’s possibilities, his supple lips smiling beatifically with the blitheness of innocence. 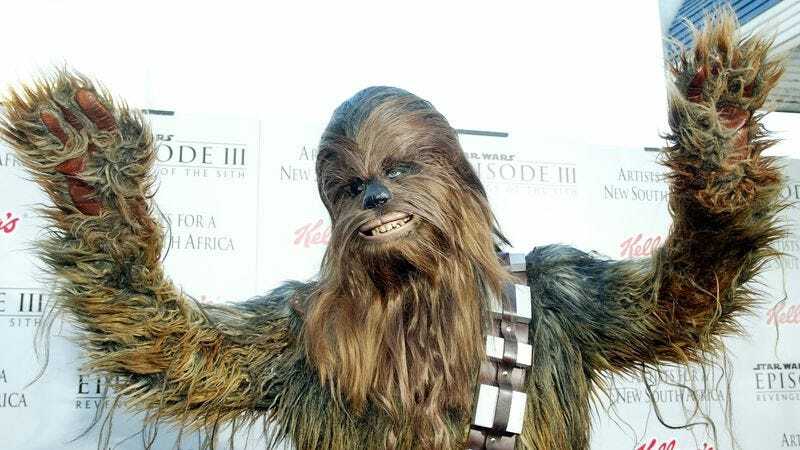 This is a Chewbacca who has spent most of his life frolicking through the forests of Kashyyyk, his flowing locks kissed by the sun—not yet matted from being cooped up inside the gray confines of a space freighter, listening to another man’s sarcastic kvetching. This is Chewbacca in the lean and golden-flocked prime of his life, like a Wookiee Robert Plant. Oh, imagine how this Chewbacca must growl—fiercely, yet tenderly, with the swagger of a yearling feigning at being a beast! Picture how he must look striding into battle, hips cockily aslant, growing into his own as he fingers his bowcaster for perhaps the first time, his blue eyes flashing with the vigor of juvenescence! Is it so wrong that you want to… kiss Young Chewbacca? Is it so wrong? Are you to be blamed for the way the robustness of youth has long proved a siren to the heart, regardless of the mind’s cautious counsel, tempting you to gaze upon the lean and sylphic frame of this hard young Chewbacca and feel the primal surge of desire? Are you to be held accountable for that which enticed immortal and mortal alike since Ganymede flitted seductively before Zeus? You are in a safe place here, alone with your thoughts, and you cannot be judged for the fleeting desires you feel. Acknowledge them, but do not indulge them. You are guilty of nothing. In a way, your naked longing for hot, young Chewbacca is the lust for life itself. Anyway, you can check out more of Young Chewbacca from the very back of a theater on May 25, 2018.